Laser & Skin Care | Woman's Clinic P.A. Fotona is a world leader in laser technology and has over 45 years of experience delivering fantastic products. Fotona’s aesthetic lasers are highly innovative and are capable of a wide variety of applications. At Woman’s Clinic P.A., we are proud to offer Fotona laser treatments to our patients. Our variety of services makes us the perfect place to seek out the aesthetic laser treatments you need. We offer Laser Vaginal Tightening (LVT) to our patients as a treatment for vaginal relaxation syndrome. By using a laser, this procedure is significantly less invasive and has a vastly reduced rate of complications. LVT has a very short recovery time, generally only two to three days after the procedure the patient can resume their sexual activity. Our doctor will speak with you about the options that we offer and help you find the right choice for you. Similarly to LVT, treating stress urinary incontinence with a laser makes the process much less invasive. This makes the complication rate lower and the recovery time very short. As long as proper precautions are taken, the patient can immediately return to their regular routine. This treatment entails a series on non-invasive treatments to the entire face area, including inside the oral cavity. The natural, rejuvenating face lift with NO SURGERY, NO DOWNTIME & Immediate Results! This is a procedure that is fantastic at treating wrinkles, keritosis, scars hyperpigmentation and damage from the sun. This application treats specific imperfections to the tissue while leaving the surrounding skin untouched. We also offer treatments for rosacea, stretch marks, scars, leg veins, facial telangiectasia and Onychomycosis (Toe Fungus). If you are looking for body contouring, laser hair removal or a massage, we offer that too. Contact us today to schedule your appointment! Incontilase – Laser treatment for Stress Urinary Incontinence: So very pleased with the incontilase. I am so grateful. Before this procedure, I had to wear feminine pads pretty much everyday. Some days if I coughed or sneezed I had to change undergarments. I have had 3 treatments and have not had any episodes where I have had to wear napkins, changed underwear or be embarrassed about a worker smelling me. Sneezed and coughed and still have dry underclothes. Better sexual stimulation also. Wonderful after being told in the past that I had to have a pelvic mesh due to incontinence. Thanks to you!! Would recommend it for anyone that needs! Dr. Johanna Trus: Just wanted to say that Dr. Trus has such a great bed side manner, she’s never too busy to answer my questions. I appreciate the recommendation from her and worked with me to have this procedure. Laser Technician/Medical Esthetician, Deborah Meza: I appreciate the good bedside manner and professionalism that was shown. Very thorough and explained everything so I could understand. Appreciate working with me. Incontilase – Laser Treatment for Stress Urinary Incontinence: I went from wearing mini maxi pads every day to not wearing any protection now. With each of the procedures, my leakage problem has disappeared. There are times, if there is a sudden or abrupt happening such as a sudden trip that I may have some leakage, but I would say I am 90 – 95% better than I was before the laser procedures. It is a great feeling and it has helped my lifestyle tremendously from fear/ apprehensiveness of being out socially and not having to worry about bladder leakage. I would highly recommend the laser treatment to anyone with bladder leakage problems. The biggest selling points are: no surgery, no hospital stays, no pain, in and out in a half hour. I am so happy I took Dr. Pappas’ recommendation! A big thank you to Deborah for being so supportive, encouraging, and empathetic through the entire process! Dr. John Pappas: During my routine pap smear, Dr. Pappas and I discussed my leakage/ incontinence problem. He recommended I try the Laser Incontilase procedure. Laser Technician/ Medical Esthetician, Deborah Meza: Deborah, the Laser Technician was awesome! She called me several times before the first procedure to assure me it was a simple, non-invasive procedure and explained step by step how the procedure (s) worked. She helped calm my fears. Deborah was gentle, sweet, and very professional during all three procedures. The Fotona laser can be used to treat the appearance of visible blood vessels that can appear as a symptom of rosacea. Rosacea is a common but often misunderstood condition that is estimated to affect over 45 million people worldwide. Multiple treatments maybe required to calm and balance the skin. Wound healing, pregnancy, sudden growth or weight gain can cause damage to the dermis breaking down the collagen in the tissue. Available scar revision therapies depend on the type of scar and range from topical creams for mild scarring to laser treatments as an effective method that improves skin texture and pigment. Post treatment products required. More than one treatment may be necessary. Small veins and spider veins can be treated with laser applied from the surface of the skin. This procedure is generally less invasive than sclerotherapy and vein stripping. It is known to be less painful with a faster recovery time. Multiple treatments may be necessary scheduled six (6) weeks apart. You are in control of the time and cost of treatment. For Leg treatments: Medium weight compression hose MUST be brought with you to the appointment (or purchased) or the service will need to be rescheduled. Consultations required prior to treatment. Additional treatment may be necessary. Limited restrictions post treatment for legs. Fotona Tightsculpting is a unique dual-wave non-invasive laser treatment for sculpting and skin tightening in all body areas. The exclusive delivery modes are used in concert for hypertermic adipocyte destruction and collagen remodeling with exceptional results. The procedure is fast, safe and an effective non-invasive alternate to laser lipolysis with NO downtime. The effects result in an overall improvement of laxity and elasticity in the treatment areas. For additional information and pricing please contact our Laser Department to schedule an appointment. Finally a treatment to stop embarrassing Nail Fungus! Fontona Laser! Consultation Required. Fontona4D is a series of synergistic, non-invasive laser treatments of both the exterior facial and interior oral cavity, enabling full thickness contraction of collagen for persistent tightening and columization without injectables. With two laser wavelengths (Er:YAG and Nd:YAG) and 4 treatment modes, anit-aging is comprehensively approached from 4 different levels, working on deeper, medial and superficial connective structures of the skin, as well as targeting imperfections. (Series of 3, scheduled 14-21 days between treatments). The natural, rejuvenating face lift with NO SURGERY, NO DOWNTIME & Immediate Results! Minimal to NO Downtime. Consultation Required. For additional information and pricing please contact our Laser and Skin Care Department for an appointment. This laser peel is ideal for patients with little to no down time. This procedure is tailored to your skins needs. Good for wrinkles, scares, keratosis, pigmentation and overall sun damage. Minimal Downtime! Skin resurfacing and rejuvenation can be performed either in ablative modes or non-ablatively, depending on the particular aesthetic outcome that the patient and practitioner wish to achieve. In addition, ablative and non-ablative treatments can also be combined into a comprehensive anti-aging treatment such as Fotona’s TwinLight Fractional Rejuvenation system. The laser light precisely targets imperfections in the skin, leaving the surrounding healthy skin untouched. The heat from the laser energy also stimulates the production of new collagen in the dermis, and the surrounding, untreated skin helps to speed the rejuvenation process. Face to Toes and everything in between!!! Facials are an excellent way to quickly restore the youthful, healthy glow to your skin. If you have ever examined your face in the mirror and found your skin looking dull and dry, it is time to book a skin care treatment. At Woman’s Clinic P.A., we work with patients that have both oily and dry skin, rejuvenating their appearance with our individualized approach. When you leave, we want you to feel happy with the renewed appearance of your skin. Everyone has their own way of promoting their health and beauty. Individualized routines, rituals and regiments that work well for their needs. If you feel the need to really see noticeable results, visiting a skin care professional is the way to go. We provide many treatments that moisturize and rejuvenate your skin. If you are looking to book a facial or a Fotona laser treatment Woman’s Clinic P.A. can help. Contact us today to schedule your appointment! Be sure to ask us about our special limited-time offer on both the Vaginal Rejuvenation (IntimaLase) & Stress Urinary Incontinence (IncontiLase) Laser Treatments. Our Laser threats BLONDE Hair!!!! Hair removal is treated in series of six (6) treatments. Touch ups or additional treatments may be necessary depending on the client. Treatments are scheduled four (4) to six (6) weeks apart depending on the area being treated. We offer individual treatments or a series for more value. At Woman’s Clinic, P.A. 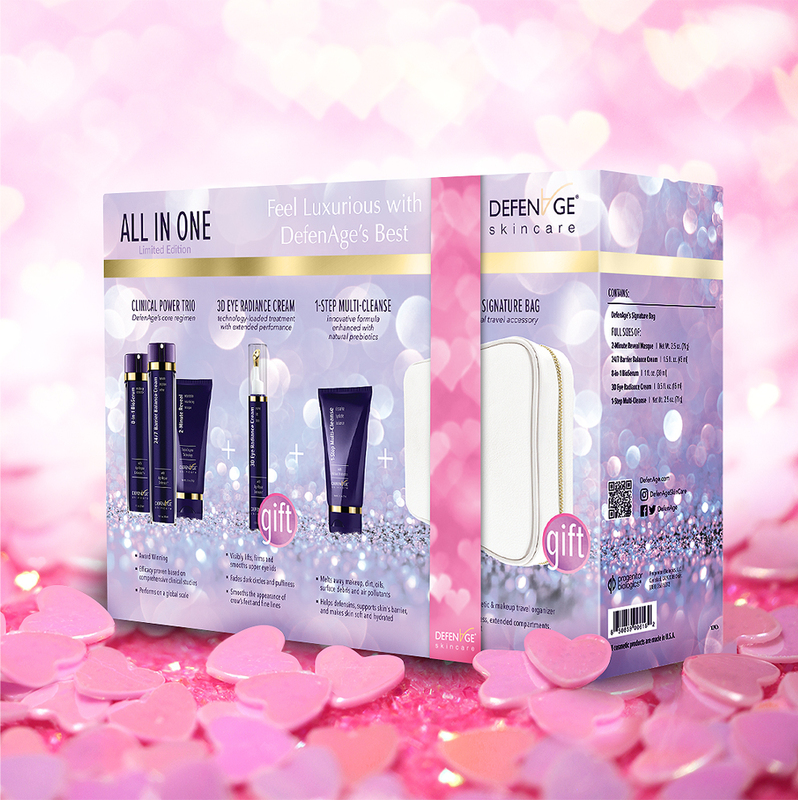 we want to offer you the very best skin care products available. We are pleased to offer you ZO by the world-renowned skin health expert Dr. Zein Obagi, MD. On post surgical scars patients are reassured and impressed that Oxygenetix after care includes safely camouflaging any evidence of surgery. 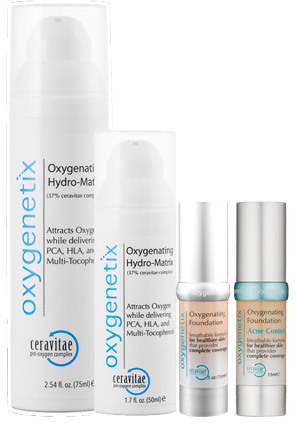 Ceravitae® the super charged oxygen peptide proliferates collagen cell and connective tissue growth in aging or wounded skin. DefenAge® Skincare is a technology-driven, evidence-based skin care line, primarily distributed through the professional aesthetic market including dermatology, plastic, and aesthetic surgery practices. The key ingredient, Age-Repair Defensins®, uses a stand-alone, natural target-specific mechanism of action for skin rejuvenation. The technology is patent-pending, and exclusively available in DefenAge. DefenAge products do not belong to the growth factor category. The Clinical Power Trio is clinical study tested, DefenAge’s core skin care regimen that addresses visible signs of skin exhaustion and aging on a global scale. DefenAge’s efficacy is documented in peer reviewed prestigious medical journals and has captured intense physician interest when presented by academic physicians and displayed at aesthetic medical conventions. DefenAge products do not contain animal- or human- originated ingredients, parabens, formaldehyde-releasing preservatives, sulfates, mineral oils, colorants, phthalates or BPA and are not tested on animals. Chemical peels dramatically improve texture and clarity of your skin. The exfoliation aids in elimination of fine lines, clogged pores elasticity and pigmentation for a brighter, healthier, balanced skin. Beautiful results in just ONE week! 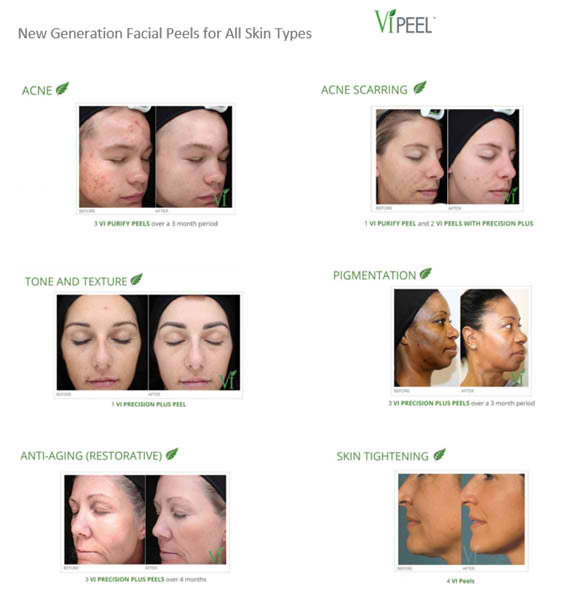 The VI Peel is designed to provide remarkable results with little downtime. This no-burn peel can help improve the overall skin tone, texture and appearance as well as soften fine lines and wrinkles. It will reduce or eliminate hyperpigmentation, melisma, age spots, freckles and acne scars. You can expect to experience four to five days of downtime with active peeling of the skin. Once the old layer of skin has peeled away you will see fresh, glowing skin. Peel is made up of tretinoic acid, salicylic acid, phenol, vitamin C and minerals. It is recommended to do three treatments of the VI Peel per year for optimal results. 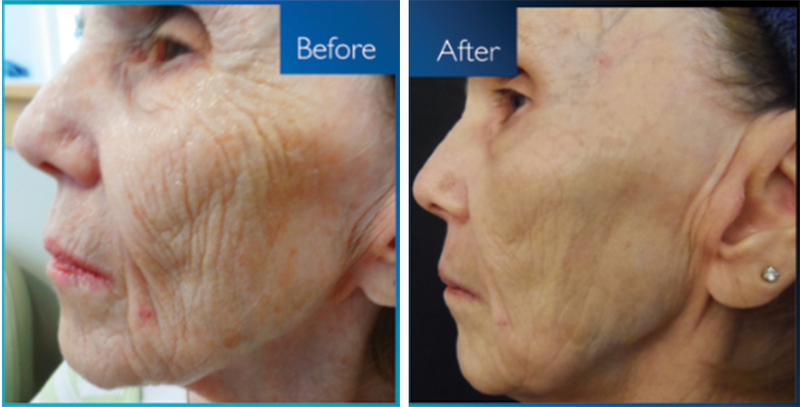 72 year old after just four LIVRA™ MicroChanneling treatments and daily use of our human growth factor aftercare serums. Next Generation PRP Facials – using the patient’s own platelet-rich plasma to stimulate collagen production to smooth lines and improve texture. Microneedling (also known as collagen induction therapy) involves using fine sterile needles to create hundreds of tiny, invisible channels in the top layer of skin. It is virtually painless and incredibly effective. The micro-injuries created stimulates the body’s natural wound healing process resulting in cell turnover and increased collagen production, therefore reversing as well as preventing signs of aging. It works the same way lasers do, only the skin is being injured in a mechanically controlled manner instead of using heat or light. Microneedling has become hugely popular among skincare professionals and their patients. With its ability to trigger the generation of new skin cells, just a few sessions of microneedling will noticeably reduce fine lines, crow’s feet and deep wrinkles on the forehead. The results are natural, minimal downtime and it is perfect maintenance for people who are trying to stave off the signs of aging. Microneedling can be done on any area of skin that needs to be repaired: Face, neck, chest, Stretch marks, acne scars, legs back, pigmented areas. First the Physician isolates growth factors from the patient’s blood. Then the provider uses a micro-needling device to create multiple micro-punctures both driving the isolated growth factor into the skin & creating stimulus for tightening and rejuvenation of the collagen of the face. Then the provider paints the growth factors onto the micro-punctures so that the growth factors soak into the tissue for further stimulation of tightening and skin rejuvenation. The skin tightens and glows with color, scaring softens for a beautiful and very natural result. This innovative combination has become a sensation in facial rejuvenation world-wide! Our Dermaplaning treatment is a cutting-edge exfoliation technique that utilizes precise stokes of a medical instrument to gently lift dull skin cells and fine, vellus hair, commonly known as “peach fuzz” . Dermaplaning will not cause fine, vellus hair to grow back thicker or darker. In fact, over time and with continued dermaplaning treatments, vellus hair appears even finer. Causing no superficial irritation, dermaplaning is an effective exfoliation alternative to microdermabrasion or chemical peels for sensitive skin types or pregnant women. Provided by trained and certified Medical Estheticians. Dermaplaning treatments are the perfect treatment on their own or as an add on to any clinical facial ideal for patients who want to stimulate the skin and activate a radiant glow! And they are Pregnancy safe!